The estimable John Noble Wilford reports on a new DNA study that shows the Phoencians, that sea-faring race of antiquity (no, not residents of Phoenix) have had a lasting genetic imprint on Mediterranean populations. “Scientists reported Thursday that as many as 1 in 17 men living today on the coasts of North Africa and southern Europe may have a Phoenician direct male-line ancestor. So those old sailors got around. I think it’s interesting that we have lots of genetic influence from the Phoenicians, but not so much cultural influence. Though, as I understand we do have to give them props for originating the alphabet. As an aside, I’m in the midst of A History of Writing and would recommend it to you all. Even if it is from the evil Reaktion Books. This piece reminded me of the stories from a few years ago telling us that half of us are descended from Genghis Khan. The NY Times has a Halloween appropriate piece on how to rid your home of ghosts and other supernatural phenomena. It reminded me of the house we rented in Denver back in the mid-1980s that had a poltergeist. Some nights we could hear him walking up the basement stairs and through the living room. I found it interesting that the sound of his footsteps woke up our dog, too. 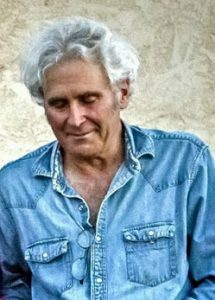 He liked to fiddle with the toothbrush glass in the bathroom and rattle the drawer-pulls on the chest of drawers in the dining room. His most spectacular performance was switching off the front porch light one night while we were out with friends. He left on his own soon after that. I thought it interesting that Wadler got through the whole piece without using the word “exorcism”. 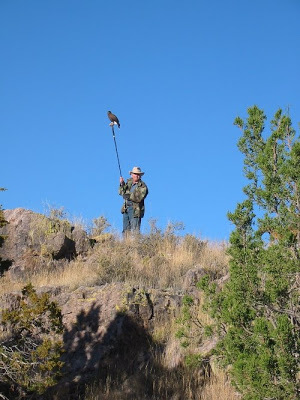 Falconer Steve Armstrong of Texas has a weak arm. Twist it just a little, and he’ll agree to anything. I’m glad this is true, since in the past year Steve consented to give a home to two hawks I’m quite fond of but couldn’t keep. The two hawks’ stories are related. First came Charlie, a male Harris’s hawk whose successful eight-year career inspired my journal In Season, and who taught me most of what I know about the many virtues of his kind. When hurricane Katrina (2005) washed away the home and hawks of Charlie’s New Orleans breeders, Tom and Jennifer Coulson, I donated him back to help rebuild their breeding stock. Other hawks (many of them Charlie’s relatives, far flung across the country) came back by way of similar donations and by the following spring were starting to produce another generation of progeny. Knowing I was suddenly without a hawk, one of the falconers in our circle lent me a three-year old male Harris’ named Smash, who was the offspring of one of Charlie’s many sisters (Charlie’s mother had over 100 young) thus a nephew of my bird. …I should note that owning to short generation times and generous clutch sizes, Harris’s hawk family trees tend to have lots of branches. Family reunion are large affairs. I flew Smash for a couple seasons, during which we developed a strong mutual respect (no hyperbole when speaking of the Harris’) and caught a lot of game. It was Smash who served to teach my dog Rina the ropes in falconry, and for this I will always be thankful. Once the Coulsons’ project was back on its feet, Tom offered me a young bird, one not closely related to Charlie but off a new pairing that was showing promise as a source of good hawks. I accepted gladly, knowing already that my schedule would not allow room for two hawks. Smash would need a home. Enter Steve Armstrong, a falconer I knew from his blog and by reputation but had not met. Steve drove down in the middle of the following season. 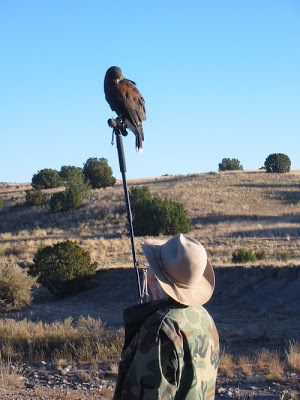 Ernie was flying then but Smash was semi-retired, having seen action only during the NAFA meet—a week of sunup-to-sundown falconry and about the only time having two hawks is a practical option for me. As Steve was new to Harris’s hawk falconry, I took him hawking with Ernie to give him a feel for the rhythm of a hunt. Steve left the next day, full of enthusiasm (he claimed) and great anticipation. In the months following, as recounted in his blog, Smash and Steve became a successful team. Steve’s team is now expanded by one. Charlie came available over the summer, having spent a few years at the stud farm but no longer needed. Racked with guilt and a considerable (for me) dilemma about how to accommodate him and Ernie both, I called on Steve yet again for an arm twisting session. As usual, it was quick and painless. Yes, he’d be happy to take Charlie. So now we are some kind of extended family, Steve Armstrong and me. I hope he’s OK with that. I know I have and will continue to offer him a little too much advice about how to manage his two birds—-birds I will always think of, somehow, as mine too. This bit of back story is meant to introduce a recent blog post of Steve’s in which he displays his considerable writing talent and wit and makes me all the more confident that “my two boys” have found a good falconer to train. Steve’s essay ranges widely, from politics to falconry to the Way of The World that exists beneath and around them both. I was tempted to reprint it entire below, but I’ll just send you there instead so you can enjoy the archives when you’re done. Does stress produce stronger offspring in birds? (Scroll down.) A researcher thinks so. HT Walter Hingley. That Japanese blog of bio- art has a spread on sperm whales that is comprehensible even if you have no Japanese. Another gem from Engrish Funny. And what’s with the skull on a spring? Unlike green Almaty, Ulaan Bataar has only one green space, the Childrens’ Park. They are planning to develop the site. If you have fond memories of it (or even if not) you can write them, explained here. HT Andrew Campbell at The Regal Vizsla. Yesterday, I thawed a package of elk that Rudy the butcher had marked “stew and bones”, figuring on meat for Rio and bones for the dogs. To my surprise it disclosed six perfect round elk shanks with marrowbones in the center, rather like the veal shanks used in osso bucco. I looked at various shank and oxtail recipes and came up with the following. After Madeleine Kamman, I put the shanks in a dutch oven with a cut- up onion, a carrot ditto, some celery, and a small head of garlic with the top cut off. I drizzled it all with olive oil and roasted it in a 375 degree oven for 3/4 of an hour. I took it out and put it on top of the stove, and added a cup of stock, a half cup of red wine, and a cup more of stock in which I had soaked a handful of dried slices of wild bolete (and the mushrooms of course.) As elk is lean, I added a half of a pig foot split longitudinally, something one local market stocks and which I keep on hand in the freezer for things like this, spaghetti sauce etc., and a sprig of thyme from the garden. I covered the pot and put it in the oven at 250 to cook for the afternoon. In the evening, maybe 5- 6 hours later, I took it out, removed the pig foot, and cooked it down until the sauce was thick. The meat was falling off the bones. If you want to be more refined you can chill it overnight and remove the fat but it was plenty good as it was. I serve such things (and oxtails, and lamb shanks) over garlic mashed potatos. From a bird who “snarled” at all dogs (you have to hear a Harris to believe the noise they make), Rio has progressed to a hunting partnership with Ataika. 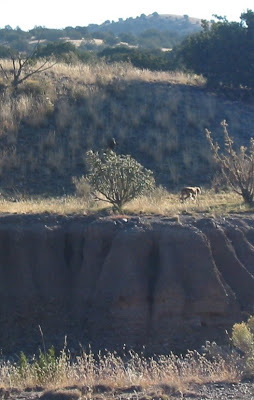 He is sitting on top of the cholla cactus above the bank beside Taik– apologies for photo quality. He usually rides on a T- perch walking stick when there are no easy trees above. 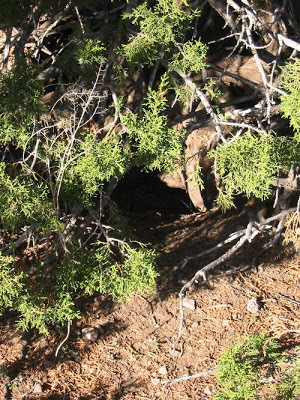 Unfortunately both rabbits he chased this morning escaped into this hole under a packrat’s nest. He almost caught the second head- on, but missed and touched the ground, which slowed him up a bit. But it was gratifying to see him chase the quarry with Ataika just below, focusing on the same thing. They both ended up looking at the hole from about a foot away. Work beckons– here we are homeward bound. 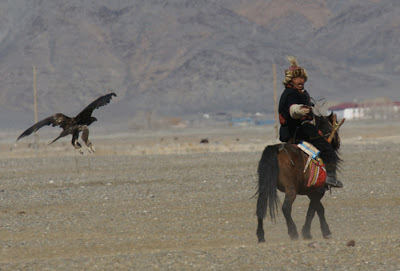 The two-day eagle festival outside Sagsai was a thrilling event, with 82 hunters on horseback with their birds, flying to the fist and to the lure. There were other events, including a camel race, a horse race, goat tug, and other fun events, but the eagles were what had brought us all to that valley. Because one of the two airlines had shut down fights the week before, there were less tourists than the year before. These were great days that ended too soon. Armanbek participated in several of the non-eagle events, so we cheered him on. But his presence there was really to help our three eagle hunters. It was Armanbek who stayed with the eagles at the rock perch and settled them in as the hunters rode down below and prepared to call them to the fist or lure. One of our hunters, Bakht, ended up in second place – at both eagle festivals we attended. 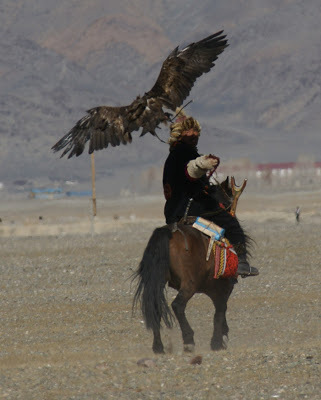 The Monday after the big eagle festival was slated to be election day in Mongolia, so many of the eagle hunters left mid-day on Sunday, hurrying home to be there to vote. We had a long, slow and painful goodbye with our Kazakh friends. I was later disappointed to read that several regions of Mongolia had such a low voter turnout that they were going to have to have re-elections. 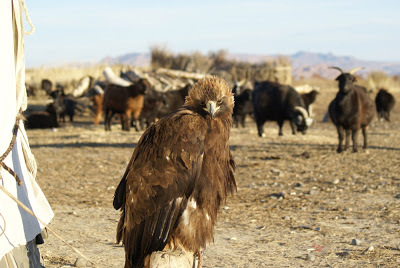 Here’s a few final images from those last few days in Mongolia. On day two of the cross-country horse trip, we awoke to the sounds of geese along the lake, with the goat herd bedded down in front of the ger. Such beauty. As soon as breakfast was over, we were on horseback, headed over the mountains. We had another fantastic day of riding, with the three eagles being exercised throughout the day. 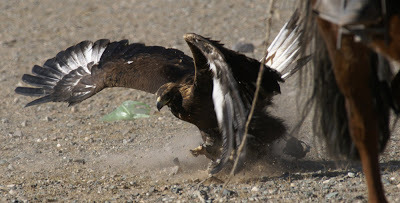 One scary moment occurred with two of the eagles tangled and went down in a clenched heap. It took Armanbek and Abutalb several tense minutes to gently unclench each talon to get the girls to let go of each other. Thankfully, neither eagle was hurt. I’ve enjoyed watching how these Kazakh men are with their animals. When we stop to rest, they slide the bits out of the horses’ mouths so they can graze without being encumbered. They also slip the felt pads out from beneath the saddles so the horses can cool their backs. I watched Armanbek pick mud and materials from the broomtails as well, using a stick as a brush. The men all talk, coo and sing to their animals – whether it is a single eagle, the horse being ridden, or the herd of goats in front. Every hand I saw raised to an animal, even in the process of death, was raised gently. The three eagle hunters and their crews all converged at a winter house for the night. We had lots of fun, playing cards, eating and singing, taking turns trying out my hot-pink iPod. The other men slept in the other side of the house, while our group slept on our side. A building full of snoring men – oh yes, I traveled 7,000 miles for this. The winter house has a solar panel hooked up to provide power to a two-battery setup in the living room to handle two overhead light bulbs. Several of the gers we have been to have satellites and television as well. It was warm in the winter house all night, which was a pleasant change from the night before. The men were out early, catching the horses and getting us ready for the day. It was very windy and we rode for four hours before stopping atop a mountain for a break. I had a near-perfect moment that day. We had ridden for hours, and stopped at the crest of a mountain to rest our horses and let our van catch up to us for lunch. The wind had been blowing like crazy. 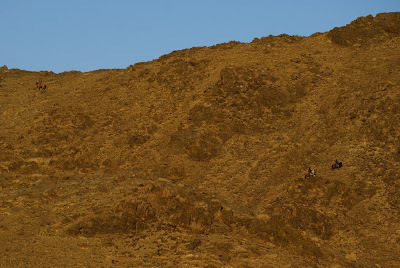 We dropped off our horses, set the eagles on rock perches, and lay down on the ground on the slope. I closed my eyes and turned my face toward the sun and was perfectly content – it really did feel like home. 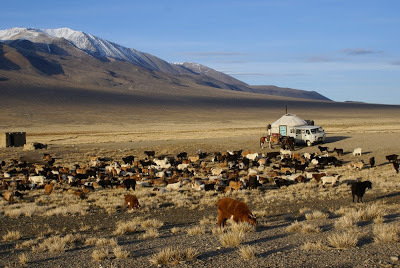 It was that moment I knew Mongolia had become part of my soul. We ran the horses across the steppe. Armanbek had another young man bring me Armanbek’s horse whip, then tried to talk me into racing him. I laughed and started, but watched as Armanbek dropped onto one knee, at a gallop, with the eagle in the other hand, and I pulled up. He thundered across the steppe on a beautiful paint horse, with the eagle in his right fist, down on his left knee. It was the finest act of horsemanship I’ve ever witnessed in all my life. He did it two more times throughout the day, but I could never get a picture. The look on his face was pure joy. Our truck caught up with us, and we dropped down into a valley for lunch, starting a fire outside another winter house to heat everything. The men promised fox hunting in the afternoon, so we rode with them again. We rode horses over mountains that only mountain goats should traverse. We flushed one fox, but the eagles didn’t see it. 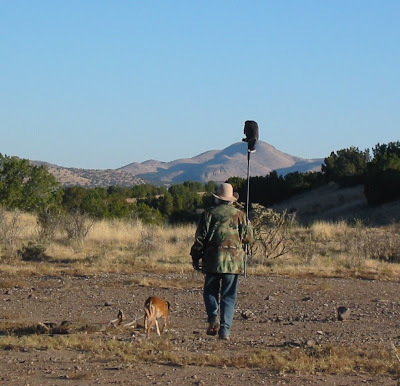 These men are like excited redneck hunters everywhere – they whoop and holler and love what they do. They help care for each other’s birds. This is a culture of eagles, so everyone pets, touches and carries them. These eagles are treated as they they bring good fortune into their lives. These are some of the warmest and most generous people on the planet. It doesn’t matter that I don’t speak Kazakh and they don’t speak English because we communicate really well anyway. They eat communally and live communally. What is for one is shared with all. Aralbai growls a lot, which I find endearing rather than intimidating. The men are full of laughter, teasing and story telling. The women work harder than the men. The men are very social, and very physical with their affection. Taking a tea break is routine (either Kazakh tea or English tea). Chores seem to be done according to hierarchy. Young unmarried men will help in the kitchen. Some friend has just sent two books from my wish list– thanks! But the name and most of the address did not print– all I can see is Casa Grande Arizona and a zip. I’m grateful anyway! Wow– I am blushing. Thanks, Nerds! As a condition of the award, we must nominate five other blogs worthy of the honor. I am taking the liberty of nominating five myself– other staffers welcome to add. At the risk of nepotism: Odious and Peculiar. Erudition and wit, mountaineering, opera, occasional cephalopods. Unique. Chas Clifton’s Nature Blog— green without the PC. Fretmarks. Perfect gems of essays, not just commentary, from Pluvialis, a poet, falconer, and historian of science at Cambridge University. Darren Naish’s Tetrapod Zoology, the best zoology and evo blog, period. Taxonomy and cladistics, technical posts on anatomy that might make you run for your dictionary, facts you never knew about familiar animals, seasoned with bits of cryptozoology. Darren knows more about more animals than anyone I know, including (well, maybe) Jonathan Kingdon. Indispensable. I encourage my fellow Q bloggers to provide some more– I could have done ten!